August has been an intense month for all the chess fans and, of course, for the elite players, who gathered in St Louis to play the Sinquefield Cup and the Rapid&Blitz Grand Chess Tour events. Maxime Vachier-Lagrave won his first top tournament, jumping again over 2800, and establishing himself in second place in the live rating list. The Rapid&Blitz event generated a lot of interest because Garry Kasparov decided to join the fray again, making the St Louis Grand Chess tour event the most followed of the last years. 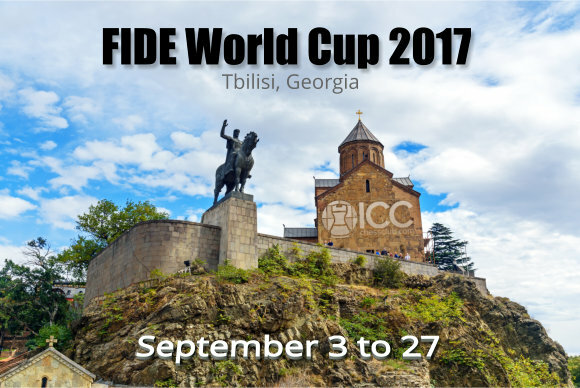 September will be another busy month, with the upcoming World Cup in Tbilisi, Georgia, from the 2nd to the 27th. The World Cup always draws a lot of interest, mostly due to the fact it's a single elimination tournament, and because the two top finishers qualify for the Candidates Tournament. This year there is a strange thing going on in Georgia: Magnus Carlsen, the reigning World Champion, will participate in the World Cup. And so will do Sergey Karjakin, who's already qualified for the Candidates'. It's a bit odd to see the World champion and the latest challenger play in a tournament that will qualify two players for the Candidates', but FIDE seems to find this normal. For the fans, it's obviously much better to see Magnus Carlsen measure himself with the rest of the "mortals," even though he won't play in the Candidates'. 128 players will start the battle, which is organized as follows: Each match consists of two games with a time control of 90 minutes for the next 40 moves followed by 30 minutes for the rest of the games with an addition of 30 seconds per move from the start of the game. If a match is tied after the two regular games, tie breaks will be played the next day, with the following format: Two rapid games (25 minutes plus 10-second increment); if the match is still tied, two more rapid games (10 minutes plus 10-second increment); if the match is still tied, two blitz games (5 minutes plus 3-second increment). If the match is still tied at this point, the players will play an Armageddon game (black gets draw-odds, and 4 minutes; white gets 5-minutes, with a 3-second increment for both players. ICC will cover this important event relaying the top boards for the first rounds and then all the boards from the 1/4th, and with three LIVE recap shows broadcast to ICCTV, with GM Alex Yermolinsky!